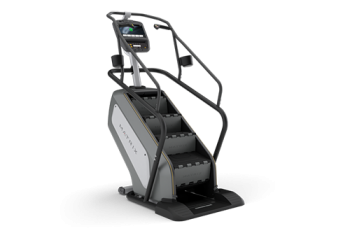 This state-of-art climbmill is a great machine if you are aiming to add extra work for your legs during your cardiovascular workout. It has s 16” touchscreen display with FitTouch Technology that offers intuitive operation and adopts the technology behind all Matrix equipment, enabling you to track your workouts and access a personal training programme. You can also benefit from the Virtual Active programming which provides an immersive exercise experience. This landmarks program enables users to scale 11 of the most famous buildings and monuments around the world. The 10” step depth accommodates a wide range of users and colour variations aid the user in proper foot placement. The step positioning software also ensures the steps will lock at the lowest possible point for easy entry and exit. This machine provides touch-free login and is compatible with most smartphones and tablets for video, audio, charging and on-screen playlist selection.